Pale Morning Duns, the name just trips off your tongue as pure poetry, and conjures up memories of bright summer days with rising trout gorging themselves on this most wonderful hatch. If God set out to create a perfect mayfly hatch the Pale Morning Dun had to be His pièce de résistance. For the scientific minded these mayflies are in the family Ephemerellidae, genus Ephemerella, and comprise four species: inermis, infrequens, lacustris, and mollita. Of these four species inermis and infrequens are the most prolific, and the most likely species the angler will encounter. In the western United States, next to the prolific hatches of Baetis, Pale Morning Duns are the most important hatch of mayflies on most of the famous trout waters. From May until October PMD's are hatching somewhere from California to Alaska. PMD's are the perfect hatch. The most prolific Baetis hatches occur when the weather is the worst, and Tricorythodes tend to reach their greatest hatching density about sunrise when most anglers are still snug in bed. PMD's hatch in mid-morning, unless the daytime temperatures reach the scorching range, which is a far more respectable time to hatch. They generally prefer bright sunny days, and on partly cloudy days they will often hatch most of the day. The spinners fall during the early evening, and if the weather is very hot they will fall during the morning hours. What a convenient arrangement. Unfortunately, as wonderful as PMD's are, catching trout when they are hatching may prove to be the ultimate test of the angler's temper. The difficulty does not lie with the PMD's, but with the selectivity of the trout that are feeding upon them. PMD nymphs are classified as crawlers and rarely venture from the stream bottom before hatching unless they are dislodged. They live in areas of fine gravel and in dense weed beds where they feed on decaying vegetation and algae. Based upon what they are consuming the nymphs tend to be a variety of colors ranging from various shades of olive, reddish brown to nearly black, and within a given area you may find nymphs of several different colors. This variation of colors dictates that the successful angler should have several different colors of nymphs to match the naturals. This is especially important later in the season after the trout have been feeding on the naturals for an extended period of time. Trust me when I say that individual trout can become very, very selective when feeding on this hatch. The nymphs begin to make casual forays off the bottom an hour or more before the beginning of the hatch. In clear water the observant angler will often observe the trout feeding on the nymphs, and a suitable nymph fished just off the bottom is a very productive method during this time. The key to success is getting the nymph down to the level where the fish are feeding, and offering them the proper color. During this period the fish will be unlikely to move up in the water column to take a nymph that is floating too far off the bottom so it is imperative that your offering be presented at the right level. Early in the season when PMD's first appear it may be relatively easy to take fish using a dry fly, especially when the number of hatching flies is low, but as the season progresses and the number of hatching insects increase, the trout tend to become more and more discerning. In addition, since the duns leave the water fairly quickly the trout key less and less on the duns and more and more on emergers and cripples. This is where the observant angler who knows what to look for as he observes trout feeding will likely be the angler who has the greatest success in connecting with the feeding fish. One beautiful Montana summer day I was fishing my favorite local spring creek during a heavy hatch of PMD's. The flies had been hatching for a couple weeks, and all the trout had a PHD in insect identification by this date. 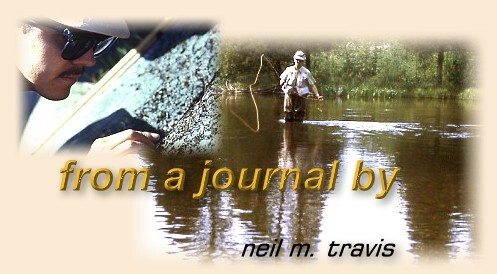 I was fishing in the tail-out of a short riffle where the trout were stacked up feeding on the emergers. Although the flies were hatching very heavily I did not observe one fish feeding on the duns, but the water was literally boiling with feeding fish. Another angler was just downstream from my position and although I was consistently hooking fish he did not seem to be having any success. After losing a fly on a particularly good fish I sat down on the bank to rework my tippet and to attach another fly. As I observed the other angler it quickly became obvious why he was not catching any fish. He was fishing a dun. Time after time he placed picture perfect casts over several feeding trout without a single response. I finished tinkering with my tackle and when I looked up he was gone, and the trout he had been fishing to were continuing to gorge themselves. While it appeared to the casual observer that the trout were feeding on the duns a more careful observation would have shown that the risers were feeding right in or just below the surface film, capturing the emerging flies before they could split the surface film and fly away. As the season progresses PMD's tend to get smaller. Early in the season the hatching duns, which are normally E. infrequens, are a true size 16, but later in the hatch cycle a size 18 or even 20 better imitate most of the nymphs and duns. I greatly love the PMD spinner falls. The imitations are easy to tie consisting of nothing more that a tail, a dubbed body, and hackle spun over the thorax and clipped off top and bottom. Some of my most favorite memories are based on fishing this simple fly to rising trout in the twilight hours of a Montana summers evening.